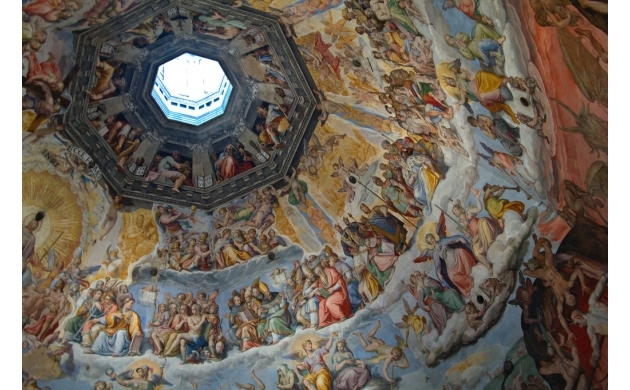 Brunelleschi's Dome, with its painted surface of 3,600 square meters of frescoes representing the Final Judgment, is the largest known religious mural. 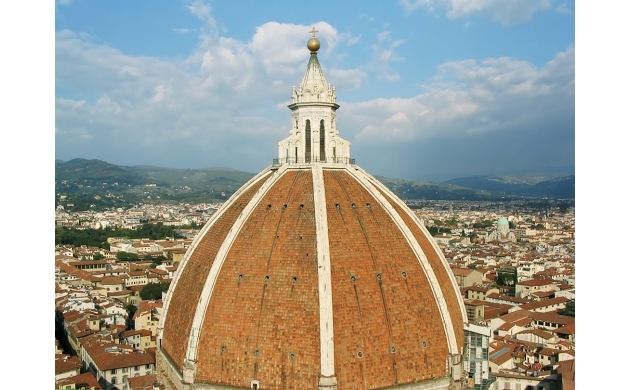 But Brunelleschi's Dome holds another record: it is visible from every part of Florence thanks to its epic dimensions (the diameter measures almost 50 meters and its height is over 100 meters) and is the largest masonry dome in the world. In other words, this architectural wonder is truly one of the great masterpieces of human engineering. The Dome takes its name from the architect Brunelleschi, the only person who was able to find a solution to the architectural problems and complete the church that was originally planned by Arnolfo di Cambio. Because of its ingenious solution, the Dome is considered to be the most important architectural work in Europe after Roman times. But why is the story of the Dome's solution so widely known? 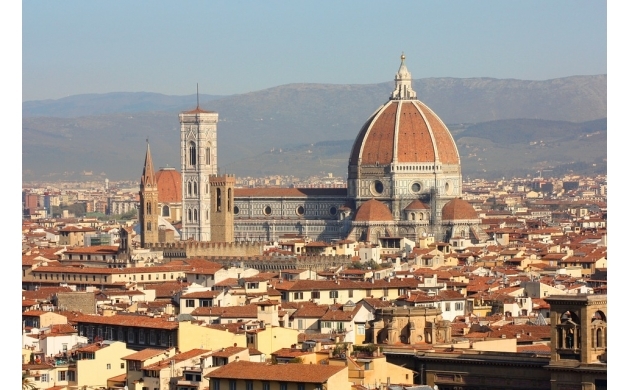 The plan for the Duomo of Florence was started in 1294, and just 20 years later, in 1314, the base that was meant to hold the dome was already ready. However, with the death of Arnolfo di Cambio (the architect who designed the dome) the knowledge of how to actually conclude the work died as well. At the beginning of the 1400s there was still no one who could solve the problem of finding a solution for the covering of the duomo, in part because the octagonal stone base created a number of technical difficulties. First of all there was the problem of a lack of tools to complete the job - in fact, at the time there didn't exist any instruments large enough or capable enough to sustain a project of such a size. 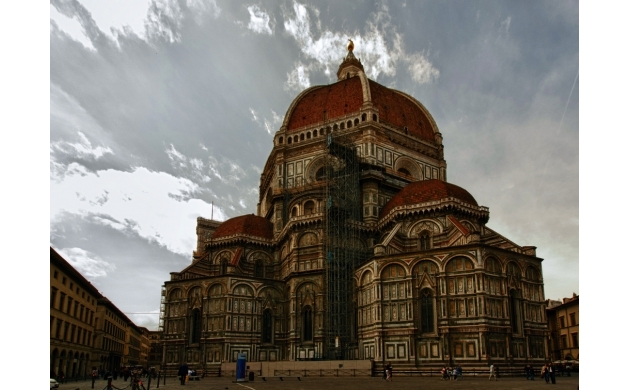 To find a solution, in 1418 the Opera del Duomo di Firenze organized a competition. Ironically, Brunelleschi himself participated in a similar competition the year before (for the construction of the second door of the Baptistry) which he lost. After he lost the competition, Brunelleschi went with Donatello to study the classical world in Rome. Returning to Florence, Brunelleschi participated in the competition for the Duomo, taking with him a small model of his design based on the Pantheon in Rome (at that time the world's largest dome ever constructed) which the architect had most likely studied in depth during his time in Rome. Brunelleschi won the competition but was placed alongside someone else: Ghiberti. This result was not what Brunelleschi wanted and in response he challenged Ghiberti in an exchange of their studies. After just a short time, Ghiberti yielded - admitting that he couldn't understand Brunelleschi's works. In this way, the responsibility for the construction returned to Brunelleschi. It was the year 1420. The solution given by Brunelleschi to the construction problems of the dome was to put it lightly amazing: the construction of a double self-supporting dome. Double because the dome was formed by two parallel layers. The internal part, thick and heavy, was built to offload the weight at the base and support the external portion that functions solely as a covering. Self-supporting because the two layers of the dome stand by themselves thanks to a structure of "fish scales." With this type of construction every brick puts is weight on the one before, with the last one placing the weight on the base of the dome. This was the true genius of Brunelleschi's plan: relying on an architectural structure capable of supporting itself, without the help of armored reinforcements and scaffolding. Brunelleschi won the battle against the forces of gravity and today, after more than 500 years, we can still admire the wonders of his ingenuity. It is possible to climb to the top of the Dome every day (except for the first Tuesday of every month) from 8:30 until 18:30. To get to the top it's 463 steps by foot - and there is no elevator. For this reason, it is not recommended for people with heart problems, vertigo, or claustrophobia.